Under each eBay account in your Listings page, you will see four options: Active, Ended, Scheduled and Draft listings. 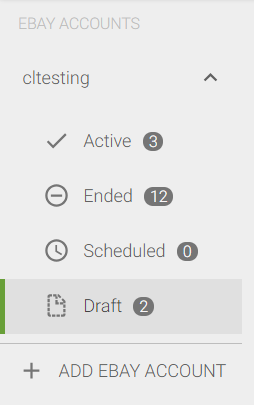 What is the Draft section used for? Under "Draft", you will find the unpublished versions of listings. Draft listings are listings that you created in CrazyLister and did not yet publish to eBay (that includes both new listings and copies of existing listings). Drafts from eBay will not import into the "Draft" folder in CrazyLister, those drafts must be published from eBay. Listings will remain in "Draft" until they are published on eBay. Each eBay account will have its own drafts folder. How do I publish a draft listing? My drafts from eBay are not showing in CrazyLister, why? The "Draft" section in CrazyLister is for listing drafts created within CrazyLister. Drafts from eBay will not be pulled in and therefore, you must publish or schedule them first. Moving forward, try creating your listings in CrazyLister.